The market off Mt. Zion Road in Boone County is not officially open yet and I’m already a fan. Shoppers in Northern Kentucky will soon be able to buy Kentucky Proud products, Kentucky wines and spirits, blended olive oils, balsamic vinegars, pastas and sauces, gourmet herbs and spices, artisan ice creams, locally raised meats, and fresh produce at the Friendly Market. The style of the market will be familiar to those who have shopped at Findlay Market in Cincinnati. Owner Jack Berberich has been working on this project for several years and the interior market is nearly ready for its grand opening. According to the Cincinnati Enquirer, an official opening is scheduled for September 7. Uncle Buck’s produce will have many local products but will also sell produce not grown in Kentucky. The Flying Olive, formerly in Ft. Mitchell, will be selling flavored olive oils and vinegars. Artisan ice cream and ice cream specialties will be offered by the Colonel’s Creamery. Friendly Meats will be offering locally raised products with many coming from Brooks Meats in Walton. Fresh, locally produced pastas, pestos, and sauces will be available at Brocato’s Italian Market. Unbridled Spirits will feature Kentucky wines, bourbon, and micro brewed beers. A Kentucky Proud General Store will feature vendors selling their Kentucky proud products. Colonel De’s Gourmet Herbs and Spices, already open, is one reason I’m a fan. Visitors to the market are treated to a wide array of spices and herbs from around the world. Colonel De Stewart features over 500 spices and blends. I was extremely impressed by his Mediterranean Oregano and his Tellicherry peppercorns. I love experimenting with herbs and spices in my cooking, as you know from my recipes, and found a new one I can’t wait to try, spinach flakes. Watch for my new recipe. Outside is a Farmer’s Pavilion featuring local farm produce. The local farmer’s market offers local fruits and vegetables. Visitors have been enjoying shopping here at the Farmer’s Pavilion for most of the summer. When Friendly Market is fully opened, it will provide Northern Kentucky with a unique shopping experience. I will be there a lot. Northern Kentucky is mostly considered a part of the Greater Cincinnati area. Many residents of Kenton County are unaware of how much of the county remains farm land in the twenty-first century. The third annual Kenton County Farm Harvest Tour, on September 21, 2013, will give visitors an opportunity to learn about the farming that still goes on in the county. Once again, farmers in Kenton County will welcome visitors, give tours, and share the bounty from their farms. Visit www.kentoncountyextension.org to download a digital tour map or pick one up at your first stop. This year’s stops are the Independence Farmer’s Market, Kenton County Extension Outdoor Education Center, Bluegrass Shrimp Farm, Redman’s Farm Winery, Poverty Hollow Farm, Funke’s Hickory Ridge Farm, Bright Star Acres, Lockhart Farm at Halt-N-Salut Equestrian Center, Triple J Farms, Rising Phoenix Farm, Atwood Hill Winery, The Pumpkin Patch, and Ed-Mar Dairy. Visitors will be able to buy produce, shrimp, local raised meat, and many other farm products. The two Kenton County wineries will be offering tastes of their wines and the opportunity to learn about the grapes grown in the county. Touring rural Kenton County would be a great way to spend a September Saturday. Hope to see you there. This weekend the city of Vevay, Indiana is hosting the annual Swiss Wine Festival. The four-day festival in Paul Ogle Riverfront Park celebrates Switzerland County’s traditions and history in wine making in the United States. 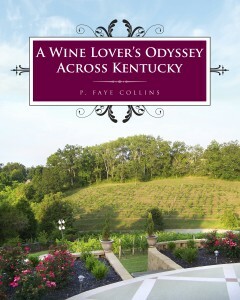 Both Kentucky and Indiana claim to be the home of the first commercial vineyard in the United States and both have a share in the story. 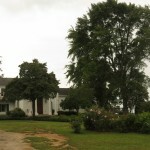 Jean Jacques Dufour, first settled in Jessamine County, Kentucky, and established “The First Vineyard,” in the fall of 1798. However, after a few years, the vineyard proved unsuccessful and he moved to another site near Vevay, Indiana. While Kentucky’s was the first established vineyard and winery, Indiana’s was the first sustained successful wine commercial enterprise. The Swiss Wine Festival is an excellent way to spend a part of your weekend. We’ve attended many times in the past and have always enjoyed ourselves. This year’s festival features amusement rides, arts & crafts and flea market booths, a beer garden, food booths, entertainment, a grape stomp, and the wine pavilion. Friday night’s concert features award-winning country singer, Tracy Lawrence. The food booths offer the usual festival fare, but also so much more. My favorite is The German Corner. After strolling through the festival, wine lovers will want to make their way to the wine pavilion down by the Ohio River. Twelve Indiana wineries will be pouring tastes for visitors. French Lick Winery is our favorite stop in the pavilion. 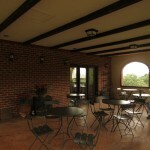 Along with the wineries, Brickhouse Cheese and Peacetree Mountain Truffles will be offering tastes of their products. The festival opens on Thursday, but the wine pavilion doesn’t open its gates until Friday at 3 PM. The wineries will be offering pours from 3 to 10 on Friday, from 11 to 10 on Saturday, and from 12 to 5 on Sunday. The Swiss Wine Festival is one of the best festivals in the region and a good way to spend some of your weekend. As a wine lover, I love to discuss wine (as you might have guessed). I’d love to hear from you. What’s your favorite wine and your favorite winery? We discovered Villa Appalaccia a few years ago and return to Southwestern Virginia to visit as often as we can. 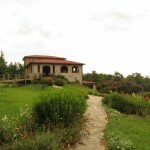 Like Bent Mountain Lodge where we always stay, Villa Appalaccia is located just off the Blue Ridge Parkway. 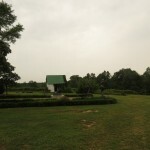 In fact, the winery is between mile markers 170 and 171, bordering the Rocky Knob recreation area on a gravel road. We return for the wine and the atmosphere. Though located in the middle of the Blue Ridge Mountains, Villa Appalaccia seems like it would be more at home in Tuscany. From the building, to the décor of the tasting room, to the landscaping, to the bocce court, visiting the winery is a wonderful experience. We enjoy the afternoon with a bottle of wine and their special offerings of bread, cheese, olives, and meats. Susanne and Stephen welcome visitors to their vineyards and winery that they began in 1989. The winery is located at 3500 feet, but much of their vineyard is at about 1500 feet and takes advantage of soil with shale to produce their excellent grapes. While every one of their wines are good, we really prefer the reds. The wines are produced in an Italian style, with Italian grapes. For instance, their Toscanello, a blend of Cabernet Franc, Sangiovese, and Primitivo is especially good. One of their best wines is the Aglianico, a red grape with a history of over 3000 years. It is considered one of the premier grapes of Italy. Another wine I would recommend is their Corvina, made with grapes native to the Valpolicella region of Italy. It is made by Susanne and Stephen by blending dried and fresh grapes to bring out the intense flavors. Spending an afternoon at Villa Appalaccia is the perfect way to end our trip to Virginia. 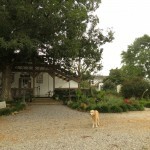 Several months ago Marshall Molliver commented on my blog about his vineyard and winery in South Central Virginia. There is a link to his website on the blog. Since we were traveling to Southern Virginia, we decided to visit Molliver’s. We googled a map and set out on Saturday. I have to say, the map looked a lot easier to follow than it turned out to be. We traveled twenty miles on a rather small two-lane mountain road. After what seemed like forever, we reached the end of the road. My reaction was to pull out a map to find another way home. 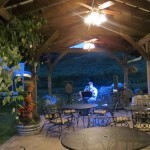 The rest of the drive was uneventful and we arrived at Molliver Vineyards & Winery. The winery is relatively new, opening in 2009. Molliver has 135 acres in Halifax County, with ten acres in vineyard . 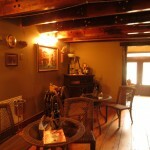 They have a cozy tasting room with lovely décor. We tasted several of their wines. My favorite was a Vidal Blanc, with its crisp clear taste. We were also intrigued by a Vin Chocolat that is a red wine with a chocolate finish. Our visit was enjoyable and the drive back over the mountains was much less eventful. It you’re in the area, stop by for a tasting. Visit their link here on my blog. Last Friday turned into one of those special evenings that happen when you least expect it. We arrived at Bent Mountain Lodge in the early evening. Bent Mountain Lodge is a lovely place to stay just off the Blue Ridge Parkway. We needed to have dinner, but didn’t want to drive into Floyd. I had read about a Fourth Friday event at a winery just five miles from the lodge. We decided to give it a try. 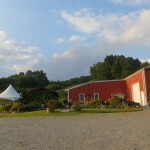 Russ and Paula AmRhein’s winery was the 61st of Virginia’s wineries, opening in 2000. Their vineyard covers 50 acres and consists of 23 varietals. 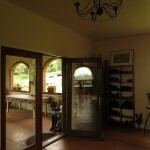 They sell to other wineries as well as using them for their own selections. The evening was filled with good pizza, great wine, and excellent music. 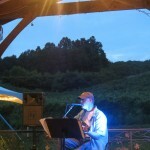 Fourth Fridays at AmRhein’s Wine Cellars is definitely to be recommended. We started out with wine tasting. 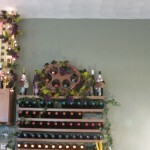 The winery was releasing three new wines that evening, Sauvignon Blanc, Traminette, and Merlot. My favorite was the Sauvignon Blanc. We also tasted several of their reds. The Aglianico was very good. Veranda, a blend of Cabernet Sauvignon, Syrah, and Petit Verdot was also really good. I also enjoyed an unusual blend of Cabernet Franc and Chardonnay that was created by a group of women to appeal to women. I think my friends will really enjoy it; the name is Seduction. After ordering pizza and getting a bottle of Aglianico, we sat on the terrace to enjoy the evening, the food, the wine and the music that was being played. The music was provided by a local musician by the name of Cary Rutledge. Cary played and sang acoustic guitar throughout the evening. His music was just what we enjoy hearing. He sang renditions of several of our country favorites, plus a song he wrote called “Getting Over You” that was recorded by Alabama on their My Home’s in Alabama album. While we meant to stay just a couple of hours, we stayed until the music was over. We didn’t plan the evening, but it was an amazing way to spend our first night in Southwestern Virginia.